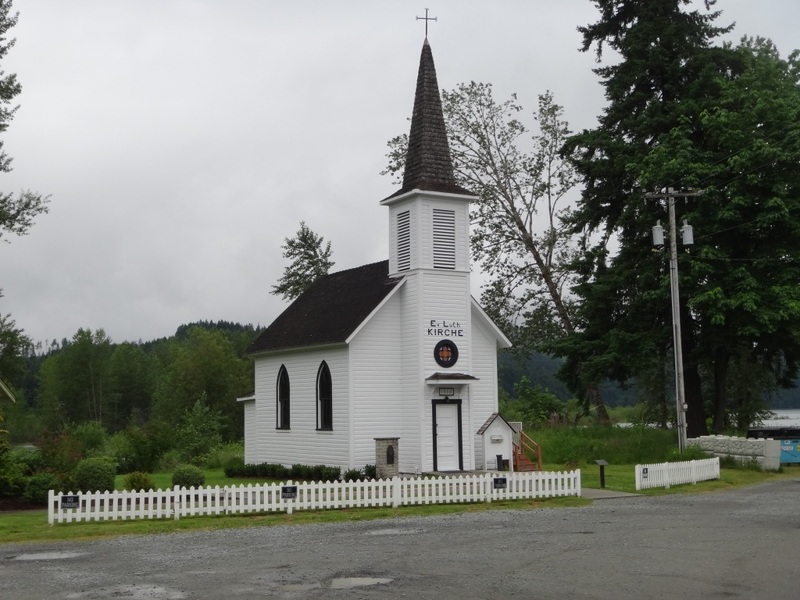 Photograph 1 - A historic "little" Lutheran church in Elbe, Washington. The building is really on the little side. 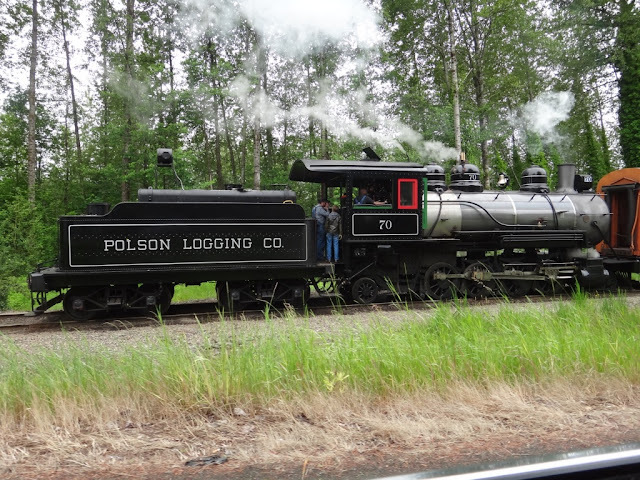 Photograph 2 - Another tourist train operating out of Elbe in Washington state. Near Mount Rainer National Park. Photograph 3 - A bread "bomb" that was hurled by the eruption at Mount St Helens in 1980. Imagine this "hot potato" flying in the air near you. Located at the Visitors Site Silver Lake, Washington, near Mount St Helens. Photograph 4 - Who is Harry R Truman - an extract from Wikipedia: Harry Randall Truman (October 30, 1896 – (presumably) May 18, 1980) was a resident of Washington state who lived on Mount Saint Helens and came to brief fame in the months preceding the 1980 eruption after stubbornly refusing to leave his home. 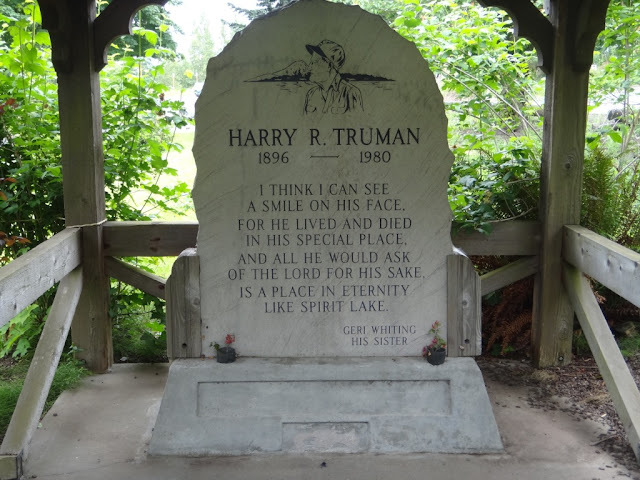 He was the owner and caretaker of Mount St. Helens Lodge at Spirit Lake. The lodge was located at the south end of Spirit Lake at the foot of the mountain, and was in the danger zone at the time of the eruption. This memorial site was discovered at our lunch site, Castle Rock, Washington. Photograph 5 - Not all state crossings are spectacular. 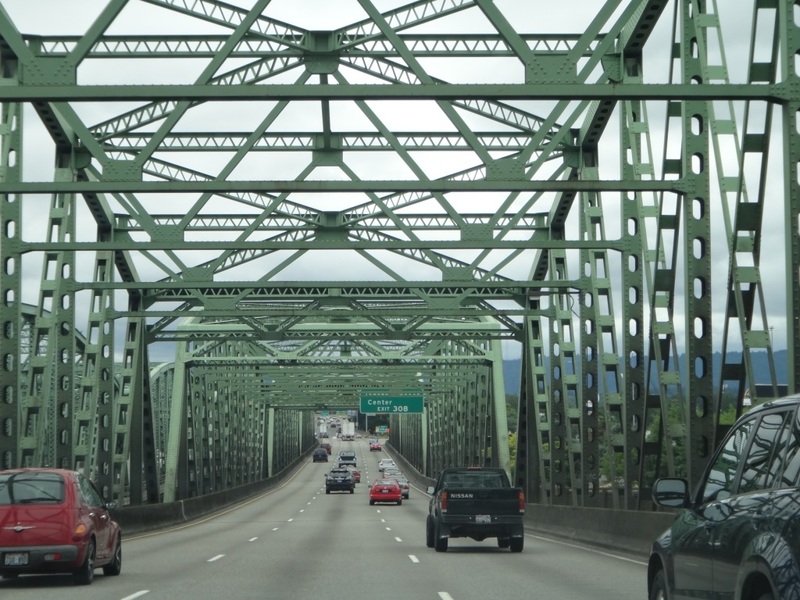 But crossing from Washington state to Oregon at Vancouver and Portland passes through a maze of metalwork bridges. Yes there are two Vancouvers in this neck of the woods, one in nearby Canada and one in southern Washington state - confusing??? Not much to say today. We were expecting to see and possibly visit one of two prominent mountains on the way from Seattle to Salem in Oregon. They are: Mount Rainer and Mount Saint Helens. The later is famous for its huge eruption back in 1980 that cause a fair amount of destruction around the countryside. Well the weather prevented us in seeing and visiting these sites - why? It wasn't raining but it was overcast and both mountains were obscured. 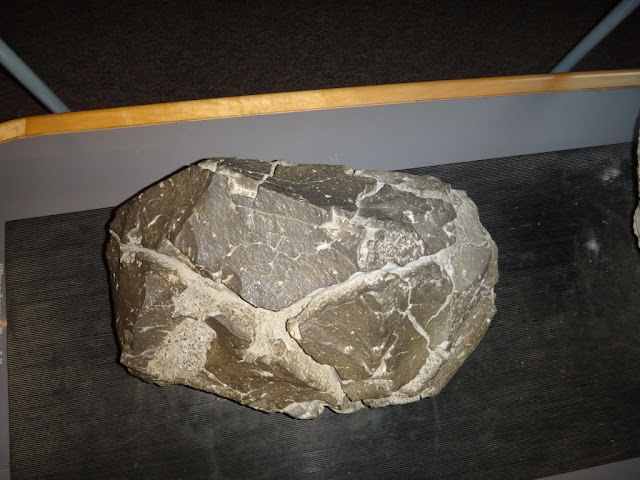 All we did was visit the Silver Lake Visitors Centre and saw what bits and pieces they had of that eruption. We stopped for lunch at a place Castle Rock and discovered a memorial tablet. The above photograph explains who Harry R Truman was - no relation to Harry S Truman who we know was the Pres of USA some time back. Why did Harry R remain in his lodge during the eruption - nobody knows. We arrived in Salem early to do some shopping, yes at Wal-Mart to cover lunches for tomorrow. It's easy to just buy healthy foods and keep them in the motel fridge for tomorrow - it is cheaper and healthier than stopping at diners that serve cholesterol infused ingredients. Tomorrow we head for a town called Medford in Oregon. We intend visiting Crater National Park where we can drive around its huge rim. This crater sits on top of an active volcano and is a must to visitor when in the area - regardless what the weather may present us. Cheers and it's is 2.5 days before Anne's birthday (well in the USA it is).